Much of the enjoyment of climbing Scotland’s munros, it’s distinct mountain peaks over 3000ft, comes from ‘getting away from it all’. This is an opportunity to get (way) off the beaten track and discover parts of Scotland you otherwise would have little reason for visiting. The December 2012 issue of TGO Magazine features a series of articles on Wild Britain including a nice article by Cameron McNeish on ‘The most remote munros’. I was inspired by Cameron’s article to look up my own top 10 list of remotest munros. While he really only suggests a few in passing – most, but not all of which, I agree with – I do share his view on the remotest of all. But first, what do I mean by “remotest” ? Well, for me, it comes down to three things: first, absolute distance from the nearest paved road; second, the effort needed to get there; and finally, the ‘feeling’ of remoteness. Don’t know what I’m talking about ? What I mean by the latter criterion is the sense you get that you are far from civilisation. This could be the lack of man-made structures in view (albeit there are arguably very few places in Scotland where man’s impact is not in evidence) of simply the feeling that “if I break my leg just now how on earth am I going to get back” ! While most of these hills can be climbed in a single day, there’s more enjoyment to be had by taking your time over them. These remote mountains are to be savoured. Why hurry ? Instead, wild camp and take two or even three days to really explore the wilderness. This is the furthest of a group of five munros in the Eastern Highlands, usually climbed from Inverey in Glen Dee in the north. While not technically difficult, it’s a long day out (40km and 2000ft of ascent), and many people use a mountain bike to cycle into Altanour Lodge from Inverey. This is what I did – with a wonderful wild camp at Altanour Lodge and an evening walk up An Socach before completing the circuit of the other four hills and cycling out. 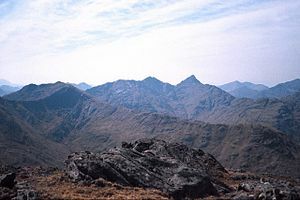 Sgurr na Ciche is the westernmost of the Glen Dessary mountains, with great views into the Rough Bounds of Knoydart. To get to Glen Dessary it’s a long journey along a narrow, winding road along the north side of Loch Arkaig. While there’s a large hunting lodge in Glen Dessary itself, the prominent peak of Sgurr na Ciche is about 6km beyond this. Sgurr Mor is a near neighbout of Sgurr na Ciche and is normally climbed from the head of Loch Arkaig also. However, it is situated in Glen Kingie, just to the north of Glen Dessary and can either be climbed on its own or with the other three Glen Dessary hills in a long outing. I wild camped in Glen Dessary and climbed the hills separately. If you think Glen Dessary is remote, Glen Kingie must surely be one of the most desolate glens in Scotland ! This is where I would disagree with Cameron McNeish’s suggestion that Beinn Dearg in the Atholl hills north of Glen Tilt is one of the remotest munros. Sure, it stands by itself some distance from paved roads, but there is a good track leading to it which is suitable for mountain bikes and it’s a fairly maneageable day trip. More remote I think is Carn an Fhidhleir which, together with its neighbour An Sgorsach, takes some effort to get to, usually from the Linn of Dee to the north or via Glen Tilt in the south. I used a mountain bike to reduce the time needed for this 40km round trip from the Linn of Dee. Seana Braigh is one of those hills that not only involve a long walk in (usually from Inverlael on the Inverness to Ullapool road) but also a winding route that ascends and descends before reaching the mountain proper. The munro stands out for its excellent views to the panorama of peaks in Scotland’s North West – see the photo at the top of this post – together with the impressive Loch Luchd Coire and Cadha Dearg valley en route. I think Ladhar Bheinn qualifies to be on this list owing to the sheer effort to get there. There are essentially three routes to Knoydart: a 3 hour walk in from Kinloch Hourn, a kayak trip across Loch Hourn from Corran (which was my route) or a boat from Mallaig to Inverie. While there are a few houses and a bothy in Barrisdale Bay, the starting point for the best ascent of Ladhar Bheinn, there is a definite ‘remote peninsular’ feeling to Knoydart that sets it apart from the rest of the Scottish mainland. At the western end of Loch Monar, Lurg Mhor stands just beyond its near neighbout Bidein a’ Choire Sheasgaich (popularly called “the cheesecake” to non-Gaelic speakers!). To get there, there’s a long walk (or better, cycle) in from the A890 followed by an even longer walk over the Corbett, Beinn Tharsuinn. But once you do get there, some wonderful views meet the eye. Neil and I made a weekend of it, climbing the five Loch Monar munros. We wild camped the first night at Pollan Buidhe next to the stream and following heavy rain, de-camped to one of the weirdest bothies I have stayed in – literally, a garden shed stood beside the track to Glenuaig Lodge ! Until he retired in 2010, a Danish boat man provided a quick and easy way to travel the length of Loch Mullardoch. When Neil and I visited these hills in 2012 we walked the 6km along the north side of the loch. Having just started the ascent up towards An Socach, the furthest of the four munros, we turned around on hearing the sound of an engine … If only we’d asked in the pub the night before, we might have discovered that an enterprising local and re-started the Loch Mullardoch boat ! Whichever way you get there, An Socach is far from any road or settlement and is one of the remotest hills you can find. Not only does it have a wonderful name, but Sgurr Fhuar-thuill also stands some 19km along the ‘private’ Glen Strathfarrar, the westernmost of the four munros. It’s a distinctly odd glen. With Scotland’s world-leading ‘right of access’ legislation I still don’t understand how a glen can have a locked gate at the foot of it and car access controlled within specified hours (but these arrangements are agreed with Scottish Natural Heritage). I must admit that it had the feel of some kind of ‘theme’ or ‘safari park’ … quite strange. For all that, however, the glen itself is particularly unspoilt with only deer, birds and the occasional walker for company. A ‘top 10’ list is inherently subjective. Do you agree ? Have I overlooked any glaring omissions or would you use a different set of criteria ? That’s good to hear and thanks for getting in touch. Lots of opportunities for getting off the beaten track in Scotland!